It's been a gorgeous and uniquely rewarding experience to collaborate in creating this piece with Leonie Cornelius for GOAL and their powerful, unique and wonderful Goal What on Earth campaign. 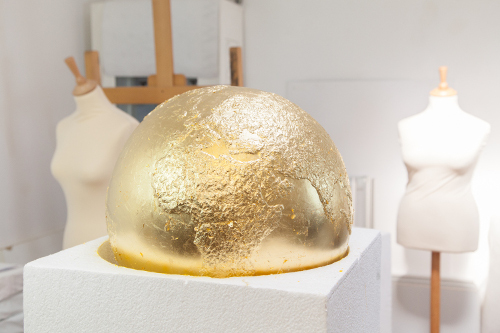 What On Earth is a collection of 100 resin globe sculptures which are being painted and decorated by artists, celebrities and crafts people from all over Ireland. The Globes will go on public display as a series of Art Exhibition’s around the country. Then they will be auctioned offin November to raise vital funds for GOAL, enabling the charity to continue its work, easing the plight of some of the most vulnerable people in the world. We have titled our piece ‘PRECIOUS MATTER’. It uses sterling silver and 23.5 carat gold leaf to highlight the precious nature of our world. We hope the artwork represents the invaluable work GOAL does globally and the positive impact it has on our fragile and precious world. 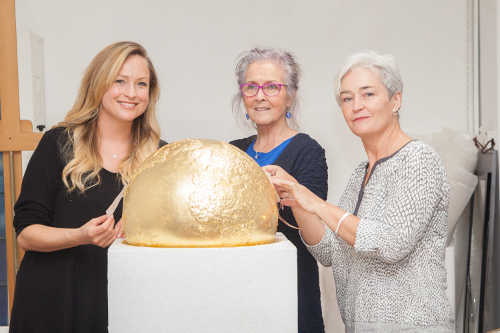 The globe has been hand leafed using traditional techniques and we cannot express our thanks deeply enough to Maureen Quinn for her time and expertise with the gold leaf process. We've also placed thirteen custom designed sterling silver daisy flowers around the globe. Each one grows out of an exact location where GOAL is currently working and we hope they symbolise the striking growth and impact which GOAL’s work has on those regions.